The Mercator projection was invented by Gerardus Mercator, a Flemish mapmaker. His name is a latinized version of Gerhard Kramer. This is his famous world map of 1569. 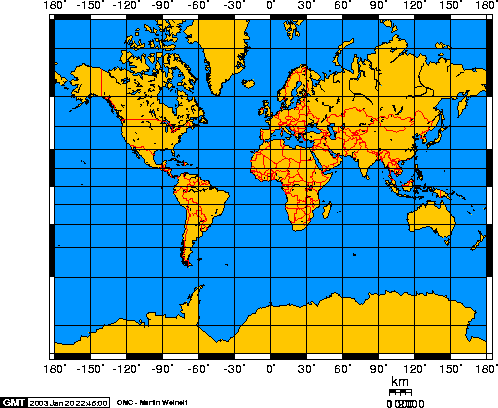 The property of the Mercator projection map that made it useful to navigators is that it preserves angles. 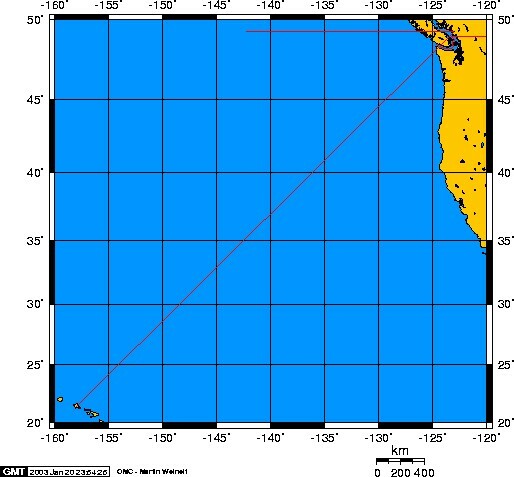 Lines of constant compass heading (called rhumb lines by sailors) are straight lines on this map. Say you're in Vancouver and want to get to Honolulu, Hawaii. You don't have GPS, just a compass. Just draw a straight line on the map between where you are and where you want to go, and measure the angle (almost exactly 45 degrees in this case). So (after a small detour around Vancouver Island) you head southwest, and off you go. If you keep heading in this direction, you ought to get there. It is for these reasons that we have progressively increased the degrees of latitude towards each pole in proportion to the lengthening of the parallels with reference to the equator. Many people have an incorrect idea of how Mercator's projection works. This seems to be commonly taught in high schools. 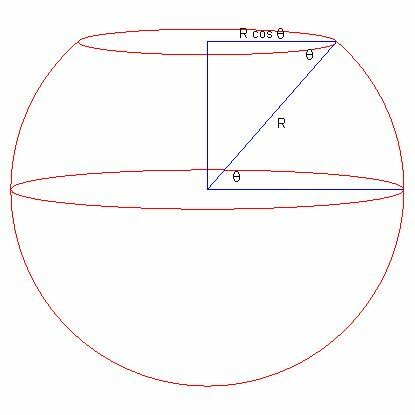 The idea is to imagine a cylinder with the globe inside, and light projected from the centre through the globe onto the cylinder, as in the picture here. Then unroll the cylinder. This cylindrical projection is NOT Mercator's projection. If you want a physical model of Mercator's projection, let the globe be a spherical balloon that is blown up inside the cylinder, and sticks to the cylinder when it comes into contact with it. In 1599 the English mathematician Edward Wright explained the mathematics of exactly how Mercator's projection should be done. Let's say that the distance on Mercator's map from the equator to the parallel at latitude is , in units where the equator has length on the map. That's not quite the language Wright uses (this was before the invention of calculus), but it amounts to the same thing. Well, now the problem is to do the integration. Wright didn't know how. In fact, he didn't know about logarithms yet, and as we'll see we need logarithms to write down the answer. So what Wright did was to do the integration approximately, using sums (like the left or right sums we did earlier) with an interval of 1 minute of arc = 1/60 degree, for all latitudes up to 75 degrees. It must have taken a lot of effort back in those days. His table was published, and was quite useful for mapmakers. In 1614 John Napier invented logarithms, and they were soon found to be quite useful in calculations. So useful that not only tables of logarithms, but tables of logarithms of trigonometric functions, were published, including in 1620 a table of logarithms of tangents. But this was still before Calculus, so they couldn't do it that way. The problem actually became one of the famous open problems of the mid-17th century. 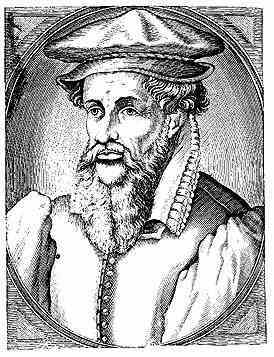 Nicolaus Mercator (no relation to Gerardus) actually offered a prize for the solution. The problem was eventually solved in 1668 by James Gregory, but his proof was extremely complicated. A more intelligible proof was published by Isaac Barrow in 1670.